The global PV micro inverters market is characterized by the rivalry between the leading vendors of PV micro inverters across the world, such as Sungrow Power Supply Co. Ltd., ABB Ltd., General Electric, Enphase Energy Inc., SunPower Corp., and Darfon Electronics Corp., finds a new research study by Transparency Market Research (TMR). These companies are aggressively concentrating on technological advancements in their products to strengthen their presence in the overall market. Continual introduction of new and innovative products is also a key strategy adopted by these players for the development of their businesses. Over the forthcoming years, the competition within the market is expected to intensify as a number of enterprises are shifting their focus towards emerging economies, having abundant untapped potential, notes the research study. As per TMR’s estimation, the opportunity in the worldwide PV micro inverters market is likely to touch US$489.1 mn by the end of 2017. Further, the market is projected to witness a tremendous upswing at a CAGR of 15.20% during the period from 2017 to 2022 and attain a value of US$990.3 mn by the end of the forecast period. Standalone PV micro inverter systems are enjoying a stronger demand than their integrated counterparts. Researchers predict this setup will remain so over the period of forecast. Currently, the demand for PV micro inverters is higher in the residential sectors. Thanks to the rising demand for continuous supply of power from individuals, this trend is expected to continue in the near future. Among all the regions, North America surfaced as the leading regional market for PV micro inverters, owing to the presence of a technologically advanced infrastructure. Rising at a healthy CAGR of 15% between 2017 and 2022, this regional market is predicted to maintain its dominance over the next few years. Asia Pacific, however, is likely to present the most lucrative opportunities for the market’s growth in the years to come. 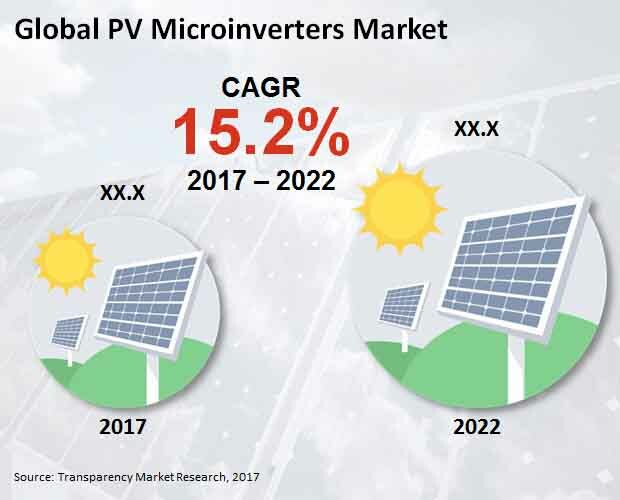 The presence of ample untapped potential and abundant solar power resource will support the Asia Pacific market for PV micro inverters to grow at a steady rate over the forthcoming years, reports the research study. According to a TMR analyst, “PV micro inverters are expected to witness strong rise in their demand, thanks to the increasing need for off grid electricity across the world.” The rising concerns over safety and security from electricity has fueled the need for access to state-of-art resources of energy. Apart from this, various favorable initiative by the governments in several countries, with an aim to encourage the usage of sustainable energy, such as net metering and feed in tariff, are also expected to promote the deployment of these inverters, complementing the growth of this market in the near future. While the future of this market looks great, several challenges, such as the high cost incurred in the installation of these inverters, may limit their adoption over the next few years, reflecting negatively on this market, states the research report.